Do you need swimming pool cleaning in Pinellas County? Then you’ve come to the right place. Triangle Pools has been providing superior pool cleaning service to our customers in the Tampa Bay area since 1959! Florida has perfect swimming weather 9 months out of the year. So, it’s important to ensure that your home oasis always looks and feels its best. One of the greatest benefits of owning your water hole is the ability to take a quick dip after an exhausting day of work. But, we understand how difficult it can be to keep the quality of the water to pristine standards. Sustaining healthy and beautiful conditions on your own can often make more trouble than it’s worth. With the fluctuating pH levels of the water, the fight against algal blooms with frequent chlorine shocks, indeterminate cloudiness, and cleaning out leaves and other organic matter that fall into it, ownership can be more work than many people are able to tackle alone. Here at Triangle, swimming pool cleaning services of Pinellas are more than our specialty, they’re our passion. Triangle Pool specializes in both residential and commercial facilities, offering our exceptional swimming pool cleaning services at an affordable price. Regardless of the size or amount of use it receives, we have a plan to suit your needs, from basic cleaning and maintenance to our supreme package that includes the free use of a salt chlorine generator! All of our employees are armed with the proper knowledge, training, and state of the art equipment to ensure that you love the water you swim in, not fear it. The back yard is the social gathering place where family and friends come to have fun and relax. Of course, your personal pond is the center of the party! That is why it’s so important for you find the right swimming pool cleaning service to properly maintain it. Improper pH levels cause dry, itchy skin, and over time can damage the lining of the walls. Incorrect regulation of the chlorine levels can lead to green, slimy feeling water if there is not enough added, or an odiferous chemical smell and an eye irritant if there is too much. Fallen leaves in the water, or collecting as detritus in the deep end, are often unsettling to your guests and takes away from their overall enjoyment. Cloudy water is something many pool owners struggle with. After shocking, the algae dies; however, the decomposing matter can stay dispersed throughout the water, too fine for the filters to catch. But even this problem can be resolved by with the addition of harmless chemical flocculants. Flocculants act as a binding agent, clumping the bits together so filters can skim them out. Swimming pools can also harbor a teeming variety of harmful microorganisms. This is especially true in locations with heavy use such as those at condominiums or apartment complexes. Chlorine evaporates quickly from the water and is difficult to maintain at high enough levels to keep the water sanitary without making it unpleasant. Even so, many species of pathogens are resistant to chlorine sterilization. These pathogens can even remain in the water after a professional shocks the water. 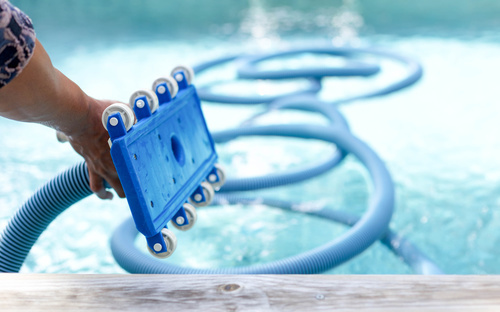 Our cleaning services offer other forms of chemical sterilization such as silver and copper treatments that are necessary to ensure that your pool is safe for all of its occupants. If your swimming area looks more like a Florida swamp, or is simply too inconvenient to keep clean, let Triangle help. Our Pinellas swimming pool cleaning services will rejuvenate your backyard and make it more inviting and fun for you and your family. Call (727) 531-0473 or reach out to us online to get started!